Whether you bring your own tackle and equipment or obtain it in NZ (as many international fishers now prefer to do due to quarantine restrictions) you'll need the right gear for the season and conditions. Ken prides himself on providing everything you will need for a great fly fishing adventure. He knows the value of using top-quality, tried and tested equipment and provides only the best: rods by Sage, waders by Simms, fly lines carefully chosen for quality and purpose. Ken ties all his own flies, modifying the patterns to match the local insect life as the seasons change. Some of his creations - like "Buggly" - are legendary. Bring your own flies, by all means - but be willing to listen to advice from a master. 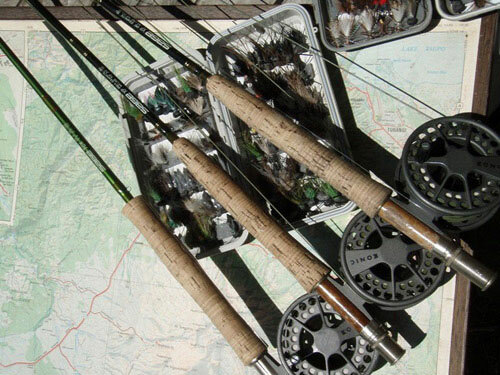 For summer fly fishing, you'll mainly use a 5 or 6 weight rod with a weight forward, floating line in a neutral colour, preferable olive or green. For winter fishing on the big rivers, you will want a heavier rod (7 or 8 weight) that can cast the heavy nymphs needed to get down to fish in fast water. Always bring a hat to shade the eyes, and Polaroid sunglasses (preferably with amber lenses). Sunblock of + 30 and a strong insect repellent are highly advisable (to keep off sandflies and midges). Felt-soled wading boots are now banned in NZ because of the risk of spreading Didymo, a horrible, slimy weed that invaded the rivers of the South island some years ago. If travelling around, you'll be asked to inspect and sanitise your tackle and waders regularly to prevent it spreading. Boots should have rubber soles with non-slip studs. Waders are necessary for the Tongariro River and other big waters. In summer, light ‘breathable' waders are highly advisable. In winter neoprene waders (with thermal underwear) are essential. All clothing including hat should be of a subdued colour (dark green, brown, beige, khaki or grey). Don't wear bright, shiny or reflective objects, including wristwatches or jewellery. In summer, prefer a long-sleeved shirt - but carry a rain jacket for showers. In winter rug up really warm, with rainproof jacket, woollen or microfiber shirt, T-shirt, beanie etc. If you are not bringing rods, tackle, boots or waders, please advise Ken so that he can arrange them for you.